At my talk in the Cambridge Climate Lecture Series I referred in the Q-and-A to a section of the talk which I hadn’t had time to include and which took the speeches of Churchill and Martin Luther King as examples of how sufficient safety could be created, when speaking to a large audience, to help people cope with their fear and think reflectively. Since then a number of people have asked me for more information about this so I have turned my notes into some readable paragraphs which you’ll find below and in a pdf here. All the other advice about how to create safety still stands – the need to have processed your own distress, to realise the shortcomings of information deficit theory, to understand and empathise with the experience of those listening to you – as does the importance of the model offered by Marshall Ganz’s Public Narrative which I discussed towards the end of the lecture and which has much in common with the features I pick out in the speeches I discuss below. Some years ago when I was talking about the need to create safe, contained spaces in which the frightening and unpalatable truths of climate change could be properly thought about, I was challenged by a climate scientist: ‘How on earth do you create a safe space if you’re having to stand up in front of a group of policy-makers, or journalists, or just people you’ve never met before?’ she asked. I had to admit that I had no idea. Although I’d got a lot of ways in which I could translate my therapeutic knowledge into one-to-one and small group situations I wasn’t sure I could answer her question. Later I reflected that something could be learned from public leaders who have had, through necessity, to talk about extremely difficult subjects to large numbers of people – about military defeat, setbacks in a political campaign, a national emergency for example. The two people who I focus on below are Winston Churchill and Martin Luther King but a more recent example who is on many people’s lips as I write, is Jacinda Ahern the New Zealand prime minister, rightly praised for her warm, public response to a terrorist atrocity. The speeches I discuss below are Churchill’s ‘We shall fight them on the beaches’ and ‘Finest Hour’ speeches (Referred to below as WFB and FH respectively) and Martin Luther King’s ‘I have a dream’ speech. King’s and Churchill’s styles are very different and use different effects but both create a space which offers some degree of safety. 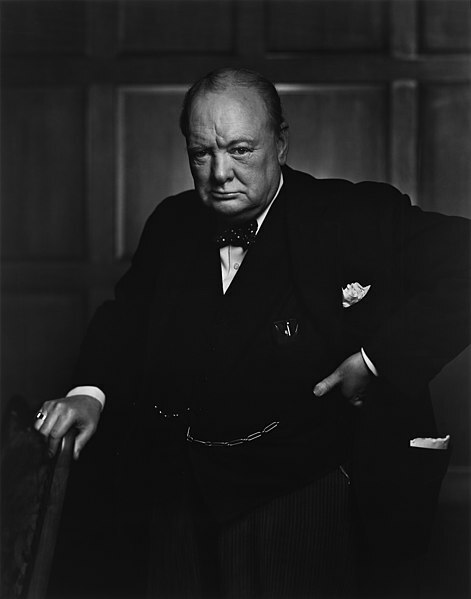 I chose Churchill for the ways he creates a space in which an audience can listen to some very difficult truths and King for the way he uses story, metaphor and emotional relatedness to connect with his audience. When talking about climate change you might not use all of these rhetorical techniques and might think some of them inappropriate but I offer them here as an example of how a certain kind of speech can make it possible to hear something very difficult and to believe that you can take action and have an effect, even when the situation feels desperate. The first of Churchill’s speeches was given on 4 June 1940, the last day of the evacuation from Dunkirk, one of the most catastrophic defeats of the British army in history, and the second on 18 June, two weeks later. At this point there was little hope of the United States joining the war and it was very uncertain how long the UK could hold out against Hitler. King’s speech focuses not on a difficult truth but on experiences of oppression and betrayal that are so entrenched that it is hard to imagine them ever changing. Both these situations share something with climate change: a terrifying truth in one and an entrenched refusal of the powerful to act in the other. Churchill doesn’t flinch from telling the truth about what has happened. He states baldly that Dunkirk is a catastrophic defeat. “…our thankfulness at the escape of our Army and so many men, whose loved ones have passed through an agonising week, must not blind us to the fact that what has happened in France and Belgium is a colossal military disaster.” (WFB) It’s true that he emphasises the courage and bravery of the British forces as a means of buoying up morale but he is absolutely clear about the catastrophe. Both Churchill and King offer truths that are stark but which cannot be disputed. This is harder in the modern world, where the claims of experts to truth are frequently challenged but sticking to the indisputable, keeping the information to a minimum and avoiding speculation are all helpful. There is often relief in hearing the truth and in knowing the worst, particularly if you can see some kind of way forward (see below about the ‘ask’). Neither Churchill nor King try to convince through information. Although they offer some facts they are not the bulk of what they say. Churchill appeals to identity, pride, strength. King speaks of identity, dignity and discipline. These are moral and emotional qualities and by invoking them the speaker implies confidence in the audience and their capabilities. Marshall Ganz makes a similar point. Identifying the ‘We’ you are talking to is a key part of Marshall Ganz’s advice too. “Europe…writhing and starving under its cruel heel” (all from WFB). Metaphor brings the moment alive and resonates emotionally. Neither Churchill nor King pretend that the situation they face is easily remediable but both are explicit about what they want people to do. What they ask is proportional to the situation (unlike many of the ‘asks’ addressed to the public about climate change). The ‘ask’ is also an important feature of Marshall Ganz’s advice. It is important in offering a way forward and crucial in preventing people from sinking into fear, apathy and powerlessness. Offering a way forward is different from offering hope. A way forward doesn’t necessarily promise an outcome, just the possibility of there being something worth doing which ought to be done. These features – truth-telling, the appeal to values, leadership, emotional connectedness, story-telling, not blaming and having an explicit ‘ask’ – are I think essential qualities to aim for. There are many things to avoid as well – demagoguery, manipulation of emotion, mob incitement – but no time for that at present! It’s a long time since I’ve posted anything, so here’s an update. I spent most of 2017 recovering from a serious illness and major operation but 2018 saw me fully recovered and active once more with various aspects of climate change and psychology. 2018 proved a year in which climate change returned to a small measure of public prominence, prompted in part by the disturbing hot summer which swept across Europe, in part by the increasingly alarming predictions made by scientists and in part by the renewal of political activism in the launch of Extinction Rebellion. Any serious political change requires a huge broad-based movement however and that in turn requires people to be able to talk about this frightening and distressing subject in ways which help others relinquish the defences they have used to protect themselves from it. 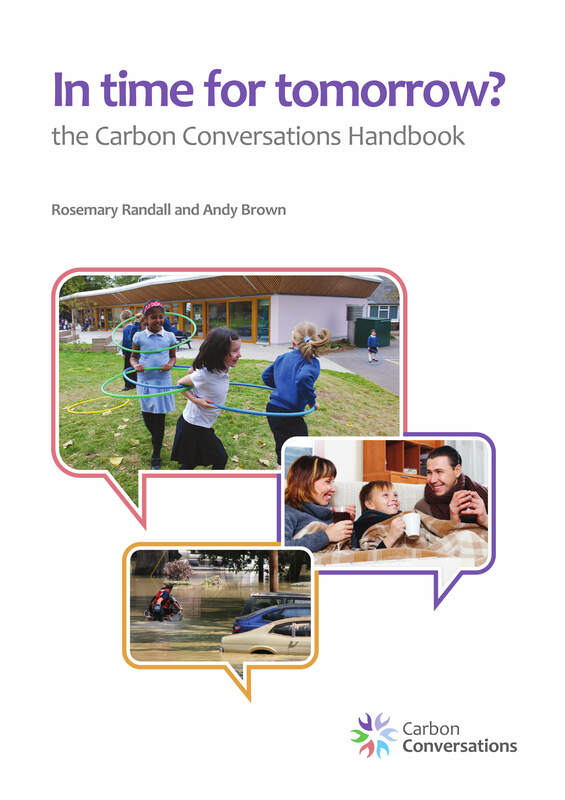 In 2018 I returned to running a workshop I first offered back in 2007, ‘Conversations about Climate Change: talking with family, friends and colleagues’. It focuses on the difficulties people so often experience when the subject enters conversation – feeling silenced, pigeon-holed, embarrassed or upset. I ran it for the Scottish Climate Psychology Alliance in April, for ‘Eco-Savvy’ on Arran in June, for the Centre for Alternative Technology’s Members’ Conference in October and for Letchworth Transition group in November. 2018 also saw the publication of the paper I wrote with Paul Hoggett ‘Engaging with Climate Change: Comparing the Cultures of Science and Activism’ which is available here or by emailing me direct. More recently I’ve been involved with Chris Robertson in facilitating the Climate Psychology Alliance’s ‘Through the Door’ workshops for therapists and counsellors who want to bring their skills to the climate movement. I was also very pleased to be invited to deliver one of the lectures in this year’s Cambridge Climate Lecture Series. It was a big departure for CCLS to include something other than science in the series and I was delighted to be made so welcome. My title was ‘Climate, Psychology, Conversation: the unconscious dynamics of how we talk about climate change’ and you can view the lecture here. Even more enjoyable was the accompanying workshop which I ran for Sixth-Formers called ‘Finding your Voice’ about climate change. I’m hoping I can offer both these workshops to more audiences in the future. Over the last few weeks climate change and environmental problems have repeatedly been bracketed with the huge numbers of refugees heading for Europe. Jeremy Corbyn in his acceptance speech for the Labour Party leadership, John Kerry at a US State Department Conference and Craig Bennett of Friends of the Earth in the Guardian, all argue, either that the Syrian crisis is intimately linked to climate change or that the population movements it has instigated give us an idea of what is to come. Is this true? And if – as seems to be the case – it is not, then why has this narrative grabbed the headlines and people’s imaginations? It’s certainly the case that climate change will bring more droughts and other extreme weather events. There may also be a case to be made that the 2010 Syrian drought was climate related. But it is a big jump from there to argue either that climate change was an important factor in the mass migrations from Syria, or that these mass migrations are an accurate picture of the future that climate change will bring. The recent droughts in California and Australia, for example, both thought to have some relation to climate change, have not produced civil war or mass migration, while the patterns of population movement that drought tends to bring are not those of mass migration across continents. There are other compelling, political reasons for people leaving Syria. If you want to understand how climate change is likely to affect patterns of migration or want to understand the relationship of the Syrian drought to the current civil war you will find good information on the UK Climate Change and Migration Coalition’s website. Why is the connection attractive? So what is going on psychologically? Why does the idea of catastrophe linked to climate change grab the imagination so persuasively? Are people hoping that such stories will spur more significant action in Paris in December? Is there sadistic pleasure in promising pain to those who have ignored warnings? Is there a masochistic reward in embracing disaster imaginatively in the mind or perhaps narcissistic exceptionalism in imagining oneself as a survivor? Or is there simply a desire to avoid the real reasons for the Syrian refugee crisis? Paul Hoggett’s article Climate Change and the Apocalyptic Imagination offers us some more sophisticated clues. He puts despair at the heart of it. He argues that catastrophizing and apocalyptic thinking are defensive responses to despair and traces the history of this mode of thinking amongst political thinkers and movements from the Second World War to the present day. You can read the full article here – its perspective is a useful antidote to the manic urgency of some of the current commentary. Understanding and dealing with our despair involves recognising how empty and powerless we can feel. Despair can involve a kind of psychic homelessness – in its depths we can feel abandoned, rootless and disconnected: refugees in our own minds. Seeing our psychic plight mirrored in the actual plight of refugees may help explain why the connection feels so compelling. Paul Hoggett argues that dealing with despair involves facing the difficulty of not knowing what the future holds and holding a balance between being justifiably alarmed and destructively alarmist. It means holding onto our core human values and striving for realistic, collective responses whatever the situation we find ourselves in. And it involves recognising but rejecting the tug of the apocalyptic imagination as its illusory promise sparks to life in each of us. Maybe easier said than done. I’ve been a Labour voter for over 40 years and today I’ve been rejected by them as a supporter – they don’t want me to vote in the leadership election and I have no idea why. My time spent scanning the rival manifestoes has been wasted, my enthusiasm for this opening up of democracy dashed. Their email telling me this starts with the chilling formula “We have reason to believe…” It goes on “…that you do not support the aims and values of the Labour Party or you are a supporter of an organisation opposed to the Labour Party.” No reason is given for this assertion and there is no possibility of finding out what information, gossip or hearsay has led to the decision. And they don’t offer to return the £3 either. I made an attempt to join the Labour party in 1975. At that time you had to be a Trades Union member and my NALGO membership had lapsed as I was between jobs. The Labour party official sitting at my kitchen table scratched his head and pondered. “I could put you down as a housewife,” he said. Feminism was more important to me than party membership so I declined, unimpressed. Forty years later I am even less impressed. I’m interested in my psychological reaction however: feelings of anxiety, a nervous racking of my brain for what the possible offence could be, a strange untethered guilt as I wonder what I could have done to deserve this response – feelings all too familiar to East Germans accused by anonymous neighbours of some unspecified offence or Americans caught up in the ravages of McCarthyism. I don’t really wish to compare the Labour party to a police state but it does seem to share a similar paranoia, accusing innocent people in unspecified ways of unspecified offences and offering no explanation or possibility of appeal. Dark times for democracy. The meaning of anniversaries changes with history. A century ago high levels of infant mortality, and the loss of life in childbirth, industrial accidents and war meant that each year a child or life partner survived was something to be grateful for and was a cause for celebration. In modern times anniversaries have become another commercial opportunity and the most trivial of annual achievements seems to be cause for bigger and more lavish celebration. Organisations too are encouraged to celebrate their longevity but for NGOs and charities longevity can make for a bittersweet party. Most of those who campaign for social justice wish that their work wasn’t necessary but the day that they can hang up their hats for good rarely comes. They find themselves, perhaps bizarrely, celebrating their continued existence alongside the problem they had hoped to eradicate. The issue has been on my mind because it’s ten years since Andy Brown and I set up Cambridge Carbon Footprint, the organisation that gave birth to the national Carbon Conversations project and which for some years was the focus of my attempts to bring a more sophisticated, psychosocial understanding to people’s approach to climate change. 2005 was an exciting year for us. I spent the early part of the year writing the paper A New Climate for Psychotherapy, describing the personal and social defences which I saw as inhibiting our attempts to deal with climate change. In May I presented this work at the Trajectories Conference at the Centre for Alternative Technology and we returned from that weekend with a new tool – CAT’s Carbon Gym, a neat little program which calculated people’s individual carbon footprints across the key areas of their home energy, travel, food and other consumption. We immediately saw that this was the practical mechanism we’d been looking for. You could use it as the basis for a one-to-one conversation that took you deep into the things which mattered to people – their homes, families, holidays, jobs and aspirations, which (unknown to most of them) embedded high levels of carbon emissions in their day-to-day lives. The rest of 2005 was a flurry of activity. 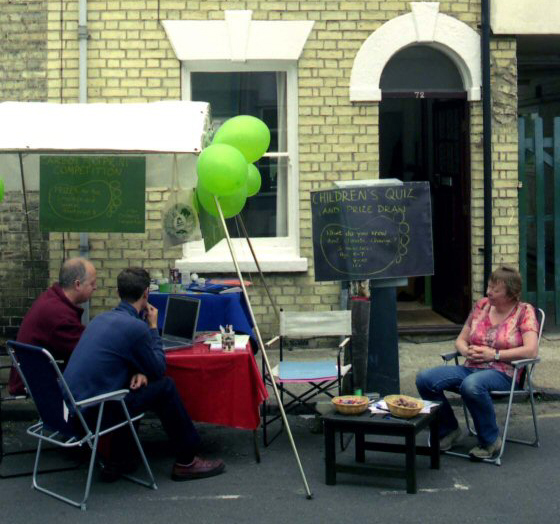 We trialled our interview technique at the Gwydir Street party in early July, calculating over 40 of our neighbours’ footprints. By the end of that month we had set up the Cambridge Carbon Footprint website, adopted a formal constitution and applied for and been awarded grant funding from the City Council. By the end of the year we had a small, keen membership, were exploring engagement with much wider groups within the community and had come to realise that the issues our one-to-one interviews opened up for people might best be explored in small groups where the painful emotions that climate change and carbon reduction engendered could be properly faced. It’s hard now to capture the excitement and hope of that period. The government was developing the Climate Change Bill (which became the Climate Change Act in 2008), funding was available for community groups trying new ideas, the energy of the environmental movement was focused on getting the outcome we needed at Copenhagen in 2009. Andy and I believed, naively, that our organisation would be short-lived, not because it would fail but because its work would become so mainstream and accepted that we would not be needed. Ten years on it is tempting to focus on what has gone wrong – the failure at Copenhagen, the retreat by the UK government from deep engagement with the issue, the seemingly inexorable rise in carbon emissions, and more personally the disagreements in CCF that led to our resignations – but perhaps it is also important to celebrate what has been achieved, albeit at a small scale. The Carbon Conversations project lives on, managed now by The Surefoot Effect CIC. Akashi, Shilpa Shah’s ground-breaking project for CCF which ran from 2006-2008 has had a ripple effect in the environmental movement in how work with people from BAME and faith groups is approached. Psychosocial approaches are now championed powerfully by the Climate Psychology Alliance and psychology generally is on the agenda when climate change is discussed. We are no longer part of Cambridge Carbon Footprint so we will not be celebrating ten years with them. (We parted company in 2011 when its trustees decided that they were no longer interested in the psychosocial methods we had pioneered and wanted to get rid of the Carbon Conversations project.) However, we wish them well and when we’re back at CAT at the end of this month we’ll raise a glass to all who helped us get our work off the ground and hope that in another ten years organisations working on climate change will no longer need to exist. Naomi Klein’s new book This Changes Everything: capitalism vs the climate is a tour de force of uncompromising argument, backed by penetrating analysis, a gift for story-telling and a deep, human empathy for those who are suffering now – and will suffer in the future – from the depredations of a turbo-charged capitalism that is ideologically unwilling and practically unable to deal with climate change. Klein is clear that only concerted national and international programmes of regulation, state investment and planning, comparable to the powers taken by UK and US governments during the Second World War, have any hope of making the annual 8-10% reductions in emissions that are now needed to bring climate change under control. She sees further than this however. She argues that tackling climate change and tackling inequality and social justice are part of the same struggle and she brings a sense of enthusiasm and possibility to this challenge. The good solutions to our climate problems could also bring lives that are more just, more equal and more worth living to far more people than currently enjoy them. Klein is not blind to the benefits that capitalism has brought to society and she is not proposing the destruction of everything that characterises our current economic system. She does however wish to see the back of the free-market fundamentalist version that has ruled the globe for the last thirty years. And she is clear that it will not leave the stage quietly. Her interviews with participants at the Heartland Institute’s meetings are chilling indeed. She is in no doubt about the struggle that we face. And she is in no doubt about the urgent need to build a political movement that cuts across the boundaries of our existing concerns. As Klein herself acknowledges many of her arguments are not new. This is territory that others have trodden before but she makes the arguments with renewed vigour and honesty and draws many threads together with meticulous research, compelling stories, vivid prose and a sense of hope and possibility that has been lacking from much writing on the climate in the years since Copenhagen 2009. One of the most interesting parts to me was her admission of her own past blindness to climate change and her curiosity about the mechanisms for this ‘ecological amnesia’ as she calls it. Klein understands that our psychological defences and our capacity for disavowal play a part in our collective failure to address the problem. But this is only one of many insights that Klein weaves into this complex and riveting book. Her understanding of the way that corporations work, her grasp of complex trade agreements, her capacity to outline the science and her historical understanding of our assault on nature – all these make her book stand out. But for me it is her empathy with the lives of ordinary people and the way she tells their stories as she makes the arguments for radical, long-term change that spoke to my heart. In a week where the UK government has published its proposals for the Paris round of negotiations with the depressing statement that growth and decarbonisation are ‘both sides of the same coin’, this is a must-read book for anyone serious about making Paris deliver on what the world, its biosystems and its people actually need. You can hear Naomi Klein speak about This Changes Everything in London on October 6th and in Oxford on October 8th. Beyond control Is psychology the missing link in changing the way our buildings perform? View the video of this event at the Building Centre. I’m the last speaker.